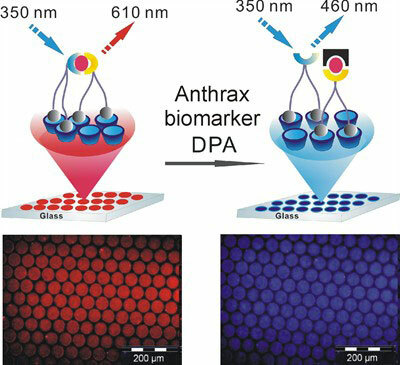 (Nanowerk News) Nanotechnologists at University of Twente's MESA+ research institute have developed a sensor that can detect anthrax spores. The invention is more sensitive and efficient than existing detection methods. The research is being published in the leading scientific journal Angewandte Chemie ("Ratiometric Fluorescent Detection of an Anthrax Biomarker at Molecular Printboards"). Anthrax - notorious as the powder ingredient in letter-bombs - is an infectious and potentially fatal disease caused by the bacterium Bacillus anthracis. This bacterium produces spores - dried bacteria with a hard shell - that can survive long-term in the open air. University of Twente researchers have now designed a sensor that can detect a biomarker of the spores and thus determine their presence in a concentration one thousand times lower than the known toxic level. A novel surface-assisted fluorescent sensing system is developed for the ratiometric detection of the anthrax biomarker dipicolinic acid on a molecular printboard. The system affords a nanomolar sensitivity and high selectivity towards DPA. Techniques for detecting anthrax spores (such as fluorescence and mass spectroscopy) already exist, but the UT sensor is much more sensitive and effective than any of them. It can also be reused in subsequent trials. Like other detection techniques, the UT sensor measures the presence of dipicolinic acid (DPA), a substance that accounts for between five and fifteen per cent of the dry weight of the spores. The sensor consists of a glass plate to which DPA-sensitive receptors have been attached. When the receptors are brought into contact with anthrax spores, the DPA binds with them. The concentration of the spores can be calculated with fluorescence spectroscopy, by shining ultraviolet light on to the sensor. DPA-bonded receptors will absorb this light and emit blue light, whereas receptors that have no DPA bonding will emit red light. By measuring the ratio of red to blue light in a sample, it is possible to determine the concentration of anthrax spores. The advantage of the sensor is that it does not need calibrating and is more finely tuned than other current methods. The next step for the researchers is to convert the system into a 'lab-on-a-chip' which will make it possible to measure samples using a fully automatic on-off process. The research is being conducted by the departments of Molecular Nanofabrication and Supramolecular Chemistry & Technology at University of Twente's MESA+ research institute. It has been made possible by NanoNed and the Netherlands Organization for Scientific Research (NWO).